"White City" buildings in the World's Columbian Exposition (1893) widely displayed and inspired the City Beautiful movement, influencing architecture with such Beaux-Arts structures as the Museum of Science and Industry building. The City Beautiful Movement was a reform philosophy of North American architecture and urban planning that flourished during the 1890s and 1900s with the intent of introducing beautification and monumental grandeur in cities. The movement, which was originally associated mainly with Chicago, Cleveland, Detroit, and Washington, D.C., promoted beauty not only for its own sake, but also to create moral and civic virtue among urban populations. Advocates of the philosophy believed that such beautification could promote a harmonious social order that would increase the quality of life, while critics would complain that the movement was overly concerned with aesthetics at the expense of social reform; Jane Jacobs referred to the movement as an "architectural design cult." The movement began in the United States in response to crowding in tenement districts, a consequence of high birth rates, increased immigration and internal migration of rural populations into cities. The movement flourished for several decades, and in addition to the construction of monuments, it also achieved great influence in urban planning that endured throughout the 20th century, in particular in regard to the later creation of housing projects in the United States. The "Garden City" movement in Britain influenced the contemporary planning of some newer suburbs of London, and there was cross-influence between the two aesthetics, one based in formal garden plans and urbanization schemes and the other, with its "semi-detached villas" evoking a more rural atmosphere. The particular architectural style of the movement borrowed mainly from the contemporary Beaux-Arts and neoclassical architectures, which emphasized the necessity of order, dignity, and harmony. The first large-scale elaboration of the City Beautiful occurred during the World's Columbian Exposition of 1893 in Chicago. The planning of the exposition was directed by architect Daniel Burnham, who hired architects from the eastern United States, as well as the sculptor Augustus Saint-Gaudens, to build large-scale Beaux-Arts monuments that were vaguely classical with uniform cornice height. The exposition displayed a model city of grand scale, known as the "White City", with modern transport systems and no poverty visible. The exposition is credited with resulting in the large-scale adoption of monumentalism for American architecture for the next 15 years. Richmond, Virginia's Monument Avenue is one expression of this initial phase. The popularization begun by the World Columbian Exposition was increased by the Louisiana Purchase Exposition in St. Louis in 1904. The commissioner of architects selected Franco-American architect Emmanuel Louis Masqueray to be Chief of Design of the fair. In this position, which Masqueray held for three years, he designed the following fair buildings in the prevailing Beaux Arts mode: the Palace of Agriculture; the cascades and colonnades; the Palace of Forestry, Fish, and Game; the Palace of Horticulture; and the Palace of Transportation. All these were widely emulated in civic projects across the United States. Masqueray resigned soon after the fair opened in 1904, having been invited by Archbishop John Ireland of St. Paul to Minnesota to design a new cathedral for the city in the fair's Beaux Arts style. Other celebrated architects of the fair's buildings, notably Cass Gilbert, who designed the Saint Louis Art Museum, originally the fair's Palace of the Fine Arts, similarly employed City Beautiful ideas from the exposition throughout their careers. An early use of the City Beautiful ideal with the intent of creating social order through beautification was the McMillan Plan, (1902) named for Michigan Senator James McMillan. The plan emerged from the Senate Park Commission's redesigning of the monumental core of Washington, D.C. to commemorate the city's centennial and to fulfill unrealized aspects of the city plan of Pierre Charles L'Enfant a century earlier. The Washington planners, who included Burnham, Saint-Gaudens, United States Capitol with monumental government buildings to replace "notorious slum communities". 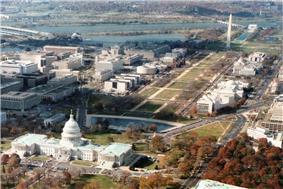 At the heart of the design was the creation of the National Mall and eventually included Burnham's Union Station. The implementation of the plan was interrupted by World War I but resumed after the war, culminating in the construction of the Lincoln Memorial in 1922. The success of the City Beautiful philosophy in Washington, D.C., is credited with influencing subsequent plans for beautification of many other cities, including Chicago, Baltimore, Cleveland, Columbus, Des Moines, Denver, Madison (with the axis from the capitol building through State Street and to the University of Wisconsin campus), Montreal, New York City (notably the Manhattan Municipal Building), Philadelphia (the Benjamin Franklin Parkway museum district between Philadelphia City Hall and the Philadelphia Museum of Art), Pittsburgh (the Schenley Farms district in the Oakland neighborhood of parks, museums, and universities), San Antonio, Texas (San Antonio River development), San Francisco (manifested by its Civic Center), and the Washington State Capitol Campus in Olympia and the University of Washington's Rainier Vista in Seattle. In Wilmington, Delaware, it inspired the creation of Rodney Square and the surrounding civic buildings. In New Haven, John Russell Pope developed a plan for Yale University that eliminated substandard housing and relocated the urban poor to the peripheries. Kansas City, Missouri and Dallas, Texas undertook the installation of parkways and parks under the influence of the movement, and Coral Gables, Florida would be an example of a city consistent with the City Beautiful philosophy. Daniel Burnham's 1909 Plan of Chicago is considered one of principle documents of the City Beautiful movement. The plan featured a dynamic new civic center, axial streets, and a lush strip of parkland for recreation alongside the city's lakefront. Of these, only the lakefront park was implemented to any significant degree. Planned out as a suburb of Florida land boom of the 1920s, Coral Gables was developed entirely upon the City Beautiful movement, with obelisks, fountains, and monuments seen in street roundabouts, parks, city buildings and around the city. Today, Coral Gables is one of Miami's most expensive suburban communities, long known for its strict zoning regulations which preserve the City Beautiful elements along with its Mediterranean Revival architecture style, which is prevalent throughout the city. 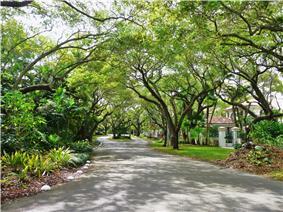 Coral Gables has many parks and a heavy tree canopy with an urban forest planted largely in the 1920s. 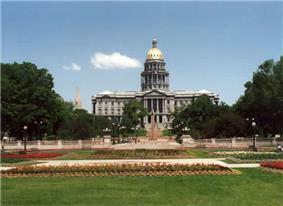 In Denver, Colorado, Mayor Robert W. Speer endorsed City Beautiful planning, with a plan for a Civic Center, disposed along a grand esplanade that led to the Colorado State Capitol. The plan was partly realized, on a reduced scale, with the Greek amphitheater, Voorhies Memorial and the Colonnade of Civic Benefactors, completed in 1919. The Andrew Carnegie Foundation funded the Denver Public Library (1910), which was designed as a three-story Greek Revival temple with a colossal Ionic colonnade across its front; inside it featured open shelves, an art gallery and a children's room. Monuments and vistas were an essential feature of City Beautiful urban planning: in Denver, Paris-trained American sculptor Frederick MacMonnies was commissioned to design a monument marking the end of the Smoky Hill Trail. The bronze Indian guide he envisaged was vetoed by the committee and replaced with an equestrian Kit Carson. At the beginning of the twentieth century there was a great passion for beautifying communities across the United States. Local minded residents of Harrisburg were convinced that the city had to make progressive changes that were synonymous to its status as the state capital. The City Beautiful Movement began in Harrisburg when reformer Mira Lloyd Dock gave a speech to the Harrisburg Board of Trade on December 20th 1900. Parts of Harrisburg toward the end of the nineteenth century would seem uninhabitable to today’s standard of living, because raw sewage had been polluting the Susquehanna River and the unpaved streets in the city. Due to the conditions that the citizens of Harrisburg had to live in, it caused the spread of diseases to be a common and recurring event. Following the disastrous Hills Capitol Fire in 1897, Harrisburg had slowly begun to transfer from an industrial town covered in mud and filth, to a beautiful city largely due to the construction of the 1906 Capitol which increased civic pride. Dock wanted to publicly challenge the horrific conditions in Harrisburg, and set out to gain public sentiment in support of changing them. Dock’s speech was titled “The City Beautiful” or “Improvement Work at Home and Abroad”, and this was the starting point for Harrisburg’s city improvements. Dock’s contemporary and closest ally in her drive for urban beautification was J. Horace McFarland, who was the president of the American Civic Association. With McFarland and Dock working together they were able to push the process of municipal improvement in Harrisburg by convincing prominent community leaders to donate money, and by gathering the support of the majority of citizens. In April 1901 the Harrisburg Telegraph a city newspaper published a front-page article on the city’s problems. The article stressed Dock’s message of beautification and recreation, paved streets, clean water, a city hall, land for parks, and a covered sewer interceptor along the river. Within 15 years after Dock gave her speech, all of these improvements, and more were in place. In the 1920s, Palos Verdes Estates, California was established as a master planned community by noted American landscape architect, Fredrick Law Olmstead. The community was designed as a "City Beautiful." Among its earliest structures were the buildings comprising Malaga Cove Plaza which were designed in a Mediterranean Revival style popular with the City Beautiful movement. It was thought that Australia, being a country that was relatively newly settled by Europeans, had wasted an opportunity to design cities comprehensively and aesthetically. Australian cities were seen as lacking beauty and civic pride. The lack of architectural features, and extensive street advertising, were also concerns. This was attributed to “materialism, apathy, short-sightedness, political interference and indifference”. Utopian city plans were another influence on the Australian City Beautiful movement. A better Brisbane, for example, was described by Louis Esson and illustrated by Lloyd Rees with a Parisian influence. However, City Beautiful was not solely concerned with aesthetics. The term ‘beautility’ derived from the American city beautiful philosophy, which meant that the beautification of a city must also be functional. Beautility, including the proven economic value of improvements, influenced Australian town planning. There were no formal city beautiful organisations that led this movement in Australia; rather it was influenced by communications among professionals and bureaucrats, in particular architect-planners and local government reformers. In the early Federation era some influential Australians were determined that their cities be progressive and competitive. Adelaide was used as an Australian example of the “benefits of comprehensive civic design” with its ring of parklands. Beautification of the city of Hobart, for example, was considered a way to increase the city’s popularity as a tourist destination. Walter Burley Griffin incorporated City Beautiful principles for his design for Canberra. Griffin was influenced by Washington “with grand axes and vistas and a strong central focal point” with specialised centres and, being a landscape architect, used the landscape to complement this layout. John Sulman, however, was Australia's "leading proponent" of the City Beautiful movement and, in 1921, wrote the book An Introduction to Australian City Planning. Both the City Beautiful and the Garden City philosophies were represented by Sulman’s “geometric or contour controlled” designs of the circulatory road systems in Canberra. The widths of pavements were also reduced and vegetated areas were increased, such as planted road verges. Melbourne’s grid plan was considered dull and monotonous by some people, and so the architect William Campbell designed a blueprint for the city. The main principle behind this were diagonal streets, providing sites for new and comprehensive architecture and for special buildings. The designs of Paris and Washington were major inspirations for this plan. World War I prolonged the City Beautiful movement in Australia, as more memorials were erected than in any other country. Although City Beautiful, or artistic planning, became a part of comprehensive town planning, the Great Depression of the 1930s largely ended this fashion. Now, however, in Australia, many streets are tree-lined and streetscapes and skylines are regulated. This was largely a result of the City Beautiful philosophy. ^ Daniel M. Bluestone, Columbia University, (September 1988).Detroit's City Beautiful and the Problem of Commerce Journal of the Society of Architectural Historians, Vol. XLVII, No. 3, pp. 245-62. ^ Jacobs, Jane. The Death and Life of Great American Cities (New York: Random House, 1961), p.375; quoted in Rybczynski, Witold. City Life: Urban Expectations in a New World New York: Scribner, 1995. p.27. ISBN 0-684-81302-5. ^ Rybczynski, Witold. City Life: Urban Expectations in a New World New York: Scribner, 1995. p135. ISBN 0-684-81302-5. ^ a b c d e f Freestone R (2000) From city improvement to the city beautiful; chapter 2. In: Hamnett S and Freestone R (eds) The Australian Metropolis: A Planning History. Allen & Unwin, Sydney. ^ a b c d Freestone R (2007) Designing Australia’s cities. UNSW Press, Kensington, pp. 45–79. ^ a b Stelter GA (2000) Rethinking the significance of the City Beautiful idea. In; Freestone R, Urban planning in a changing world: The twentieth century experience. Taylor & Francis, pp. 98–117. ^ Banks JCG, Bracks CL (2003) Canberra’s urban forest: evolution and planning for future landscapes. Urban Forestry & Urban Greening 1(3), 151-160. ^ Ward A (2000) Assessment of Garden City planning principles in the ACT. Environment ACT, Heritage Unit, Canberra. Available at http://www.tams.act.gov.au/__data/assets/pdf_file/0019/13177/gardencity.pdf (verified 18 May 2009).